Bede was involved in the racing industry for over 50 years, commencing as a trainer in 1962. He began his career at his property “Rissmore” which is located at Conjola on the New South Wales south coast. 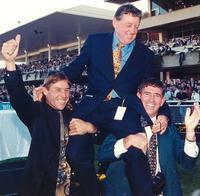 In 1994 Bede expanded his operations to set up a training complex at Kembla Grange. His legacy is now kept alive by his sons, Paul and Graeme. Paul began working for Bede at our Conjola Stables from a very young 14 years of age. He has been running our Kembla Grange Stables, "Hussars Lodge", since 1996. Paul became a qualified trainer in 2005 and has played a pivotal role in the conditioning of some great horses over recent years like Universal Prince, Victory Vein and Half Hennessey. Paul is a true horseman with a passion to succeed. He now has his own record of outstanding winners including Predatory Pricer, Alma's Fury and Phenomenal Lass. Graeme has been involved in his father’s business for the last 20 years, doing track work riding and looking after the spelling horses, brood mares and foals on the Conjola property. He is also a qualified trainer and enjoyed his most notable success with Kenny’s World.